Some wild Blue-winged Macaws have problems with cataracts when they age, which limits their ability to find food. Both adults: forehead red; crown, nape, and lower cheeks green/blue; red on low back and middle of abdomen; blue tail with red/brown around base. Bill black. Bare cere and face pale yellow. Eye orange. Red forehead paler; red on abdomen and back tinged with yellow; tail shorter. Eye brown. Loud screeching and other raucous calls. ML Media Collection Catalogue 115422, Blue-winged Macaw Primolius maracana, Marantz, Curtis, Espirito Santo, Brazil, Dec. 14 1999, Cornell Lab of Ornithology. Should have access to large enclosure at least 15m long for part of the year. If breeding, may be kept in suspended cage 3m 9.8 ft) long. Keeping permanently indoors not recommended. Soaked or sprouted sunflower seed; walnuts, roasted peanuts, pecans, Brazil nuts, pine nuts; fresh corn or boiled maize; fruits such as: banana, orange and others if taken; small amounts of wholewheat bread, and complete kibble for macaws. If in tropical area palm fruits can be given. Love to climb and play. Provide lots of bird-safe chew toys of wood and vegetable tanned leather. Also provide safe branches to chew. Provide as much room for activity as possible. 12" x 12" x 24" (30.5cm x 30.5cm x 61cm) vertical box. Trapping for wild bird trade, habitat degradation and loss, and persecution. Found in E Brazil at Ilha da Marajo, Para, and southern Para and Maranhao south to Mato Grosso, Sao Paulo and formerly Rio Grande do Sul, and scattered through E Paraguay to NE Argentina. Found up to 1000m (3280 ft). Occurs in tropical and subtropical evergreen and deciduous forest, including Atlantic rainforest and cerrado savanna; prefers forest edge or areas close to water. In northern Bahia found in gallery woodland in caatinga zone. Recorded taking seeds of introduced species Melia azedarach in NE Brazil; other details on diet lacking. 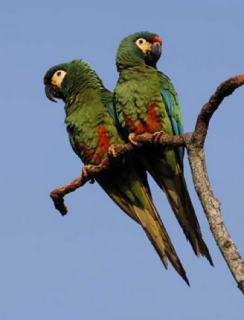 Prefers to stay in one area, occurs in pairs or small groups; less conspicuous than larger macaws. Avoids flying across open country; preferring to instead fly amongst trees. December in Brazil, February in Argentina.